I am very behind with my blogging - so apologies in advance for a flood of retrospectives! So, rewind back to early March, when Al and I escaped from the February blues to get our sea fix and went to stay with my lovely sister in Devon. 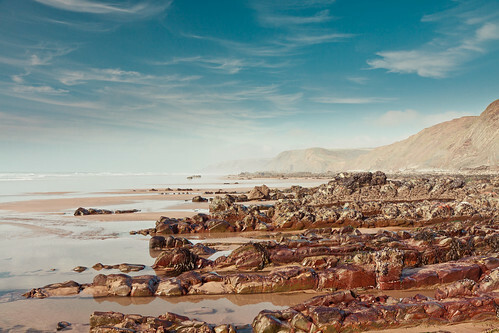 A fabulous long weekend ensued, kicking off with a trip to the beautiful Sandymouth Beach, just across the border in Cornwall. 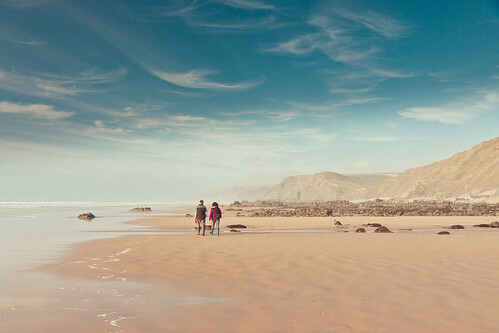 This is definitely one of, if not my favourite, beaches in Cornwall and Devon. 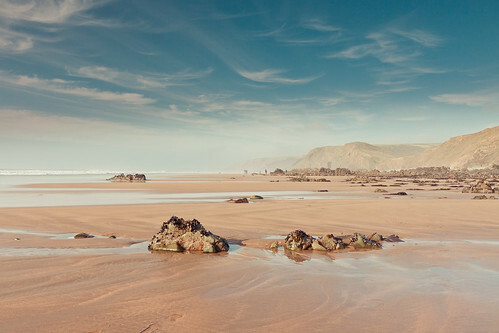 It has everything you could ask for - long stretches of sandy beach (perfect for reflections of clouds), the finest round smooth pebbles, amazing cliffs and rock strata, and even a waterfall! It is popular with dog walkers, so there is always lots going on. And there is a lovely National Trust tearoom to boot too. We also got to the fabulous Saunton Sands beach, with its epic wide open space and beautiful dunes, and to Woolacombe too, for good measure. In between we ate lots of lovely food, talked crafty things and my sister taught me to knit :) I made the grand total of 2 scarves for my Blythe dolls! Oh and I may also have converted my sister to the world of Blythe - we spent lots of time plotting all the lovely things she could make for her Etsy shop. Happy times!